ProteinBrain.com | Info, tips, and knowledge about the most essential nutrient. The most popular protein powders contain dairy ingredients, without fail. If you are lactose intolerant or have any kind of dairy allergy, this is a disaster. Even if people who aren’t sensitive to dairy may want to avoid it, for example people who follow the paleo diet. Dairy tends to have a bloating effect, and invariably seems to cause acne breakouts. (probably due to the skin’s response to dairy’s high IGF-1 stimulus) If you look into it a little you can find quite a few terrific protein powders that have zero dairy. Here are our 4 favorites, all of which are soy-free and all-natural. Two of them are vegan, and the egg protein is paleo as well. Pea Protein Isolate - Vegan, Non-GMO, Lactose, Soy and Gluten Free Yes Yes No! Avoiding dairy – not such a bad idea after all! Allergic reactions occur due to the body mistakenly believing that the dairy protein compounds are harmful attacking cells. Since the body believes it is under attack, it produces Immunoglobulin E antibodies to fight off the dairy proteins. Producing these antibodies puts some strain on the body though, making your mast cells release histamine all throughout the body – histamine’s itchy, inflammatory effect is what you are actually feeling when you have an allergic reaction. No dairy – Better health! There are plenty of good reasons to avoid dairy, even if you aren’t allergic. Dairy consumption increases IGF-1, which can cause acne even in adults, according to this study. Dairy is well known to cause water retention in a lot of people, which makes your skin look puffy and “soggy,” and makes you feel heavier and look fatter. Cut out dairy from your diet and you might be surprised how lean you actually are! Dairy is commonly sourced from inhumanely raised cows. While you can find humanely raised milk at the store, your protein powder manufacturer is almost certainly not going to this trouble. Similarly, since most supplement companies aren’t going to pay for organic, grass-fed whey for their protein powder, you are probably consuming pesticides, antibiotics, hormones, and even GMO’s with every protein shake. This article by Dr. Mercola lays out the quite serious dangers of non-organic dairy, including brain damage from pesticide exposure. One study found twenty pharmaceutical substances in an average sample of non-organic milk, including estrogenic steroid hormones. Food shouldn’t come from stainless steel factories, food should come from nature! Whey protein powder is easily the most popular kind of protein available, but unfortunately it does contain dairy. Whey is basically the liquid element of milk. Milk is separated into liquid and solids (called curds) as part of the cheese-making process. The liquid whey is sold to the supplement industry for a very cheap price (this is why whey is the most common protein powder source) and the liquid goes through a factory process that turns it into whey powder. Separated milk: curds on the left, whey on the right. Casein – Another dairy product on the case! Another common protein powder source is casein. While a great, slow-acting source of protein, casein-based protein powders do contain dairy, since casein is produced from milk protein, which is 80% casein. Usually protein powders that contain casein will be marketed as casein protein, and can be avoided. However, if you look at the ingredients of a cheap protein powder, you may find casein even though it’s not advertised as such. Custard, diacetyl, lactalbumin, lactalbumin phosphate, lactulose, rennet casein, whey protein hydrolysate and tagatose. Fortunately for individuals sensitive to dairy, you no longer have to avoid protein powder altogether. Protein supplements made from peas, eggs, beef, rice, hemp, and more are all perfectly good protein sources. They may even be better than whey protein, since they are typically made with purer ingredients and therefore tend to digest better, giving you more of the benefits of protein with less highly-processed junk clogging up your system. Your first stop when looking for dairy-free protein should be one of these vegan options. Pea protein is the most popular, but you can also find rice protein or hemp protein. We recommend pea or hemp first because these two are hypoallergenic, meaning that virtually nobody will have any sort of reaction from consuming them. Even though soy protein is dairy-free, the dangers of soy are too great to recommend it. Soy has some indigestible ingredients in it, called anti-nutrients, which cause damage to your body. It also imbalances your hormones, since it acts like estrogen in your bloodstream. If we had to choose, we’d take dairy over soy! None of the dairy-free proteins that we recommend contain soy. If you follow the paleo diet you are going to have to avoid dairy. Before cows were domesticated, a relatively short period of time ago in an evolutionary sense, there was no dairy in the human diet. Therefore, paleo dieters should always choose dairy-free protein powder. Beef or eggs make good protein sources. We prefer egg-based protein powder, since beef protein can taste a bit odd. Protein powder made from eggs? Amazing. It seems like soy is in everything nowadays, from your breakfast cereal to the oil your sardines are packed in. Even protein powders have soy ingredients now, especially soy lecithin, which is just as bad for you as any other form of soy. Most low quality protein brands are cut with soy fillers to get the costs down and the profits up, since soy is much cheaper to use than pure whey or other protein sources like hemp or peas. If you avoid soy in the rest of your diet (you should!) then you ought to find a good protein powder without soy as well. This is especially important if you’re vegan, since many vegan protein brands use soy as their protein source, which is not really a good idea! The table below lists the best protein powders without soy; many of them are vegan, gluten-free, and dairy-free as well. A few are even raw and organic. For more information about the risks of soy in your protein shake, and for details about each category of soy-free protein, keep reading after the table. What’s So Bad About Soy Anyway? Soy is a well-known hormone disrupter, which imitates estrogen in your body. As the following chart displays, soy produces estrogenic activity in your bloodstream over one million times greater than an egg does. Estrogen, although an essential hormone for both men and women, must remain carefully balanced with the other hormones. When estrogen is artificially raised out of balance by soy consumption, the effects can be very bad, ranging from fat gain to brain fog to increased risk of breast cancer. Soy lecithin, a very common ingredient in protein powders, is just as bad as regular soy. Men with high estrogen from eating soy will find themselves growing breast tissue and losing muscle. Although a healthy level of estrogen is important for women, when estrogen is imbalanced with other hormones thanks to an artificial boost from soy, cancer risk goes up, it becomes difficult staying trim and fit, and anxiety becomes very common. The body’s hormone system is a finely-tuned machine, and when it is thrown out of balance by artificial disruption like processed soy intake, the results can be very bad. Avoid soy! The artificial estrogen-like compounds found in soy protein are called phytoestrogens or isoflavones. Basically, these are molecules which resemble real human estrogen so much that when you consume them in your soy protein shake, they go into your bloodstream and act like extra estrogen, causing a feminizing effect in men and a hormonal imbalance in women leading to increased bodyfat and cancer risk among other things. Soy lecithin contains soy oil which includes the compounds, campesterol, beta-sitosterol, and stigmasterol. These compounds, called phytosterols, are also very estrogenic and block healthy testosterone production as well. Toxic Anti-Nutrients – Soy Protein Is a Disaster! There are other ingredients that can be used to keep protein powder from being clumpy, but soy lecithin is the cheapest one so supplement companies nearly all use it, despite its estrogenic, antinutritional healthy dangers. You should look for sunflower lecithin instead, a much better alternative that a few higher quality protein powder makers are now using. While the FDA requires that protein powders declare whether or not their product contains soy lecithin (look for it on your protein powder’s label), it seems that some companies are trying to slip into a gray area and avoid this regulation. Several protein powders available on the market claim that their product contains “lecithin” and don’t mention whether it is soy lecithin or otherwise. Lecithin does not exist by itself, it must be derived from some product or other, whether it is sunflower lecithin or soy lecithin. It’s a safe bet that if your protein powder mentions “lecithin,” it is probably soy lecithin, since soy lecithin is the cheapest for manufacturing by far. Some protein powders don’t mention lecithin at all in their ingredients list. Unless your protein powder is impossibly clumpy, it is very unlikely that it doesn’t contain some sort of lecithin. If the supplement company won’t even mention lecithin on the label (which is illegal) then they are hiding something, probably the fact that they use soy lecithin! Stay safe out there and do your best to avoid this junk! Soy-free Vegan Protein Powder – Yes It IS Possible! Although many protein powders now have soy in them, there are quite a few high quality protein powders without soy. Our list includes a good whey isolate product without soy, but if you want to avoid whey as well as soy, perhaps because of lactose intolerance, you could try pea protein. Pea protein is hypoallergenic and great for people who react badly to other, heavier protein shakes. It’s actually one of the best vegan protein powders for weight loss. Protein shakes that contain soy will have a fat retaining effect, due to the estrogenic effect of the soy. You don’t have to worry about that with pea protein. If the idea of drinking powdered peas gives you the willies, but you still want a gluten-free, dairy-free, soy-free protein powder (the list of benefits just goes on and on!) then another good plant-based protein powder is hemp. Hemp protein has all the same benefits of pea protein; it’s hypoallergenic, soy-free, and it’s a great protein source for vegans as well. If you are getting stomach aches or bloating after a protein shake, your first thought should be about probiotics. Amazingly, your gut is actually a fully functioning ecosystem of sorts, full of literally billions of beneficial bacteria. These bacteria, called probiotics, are one of the most important aspects of your health that nobody seems to know about! You need a healthy probiotic colony in your stomach to properly digest protein powder, or any food really. Your protein shake doesn’t just automatically get absorbed into your body, you need these probiotic bacteria to essentially “pre-digest” it so that your body can absorb all of the protein and get 100% of the nutrients out of it! Protein powders with probiotics included are one of the best ways to stay on top of your probiotic intake. For a detailed look at probiotics, nutrient absorption, and even mental health, please keep reading after the list. Excess sugar consumption, waxed fruit, plastic-coated dust – our whole modern environment destroys our digestive system by killing the probiotics that should live in our stomachs, which gives us a hard time when we try to digest a protein drink. If you can’t find a protein powder with probiotics, then you ought to eat fermented foods alongside your protein shake to get those probiotics in. Now, not all fermented foods are created equal when it comes to probiotics. Sauerkraut is the absolute best for probiotics, there are billions of different strains of probiotics that grow on sauerkraut cabbages. Korean Kimchi is a close second. Unfortunately, the sauerkraut you get at the grocery store probably is completely sterile due to pasteurization, with no probiotics in it at all – useless for our purposes! Ideally you would make sauerkraut yourself and avoid this problem (there’s many simple recipes available) but if you just don’t have the time, you should look for a sauerkraut brand that isn’t pasteurized. Your local farmer’s market would be a good place to start looking. If you just can’t stomach the idea of eating sauerkraut with your post-workout protein, you can get protein powders with probiotics included in them. Most people find whey protein in particular is much easier to digest with probiotic bacteria in the mix. For a paleo option, there’s beef or egg derived protein powder with probiotics as well. Protein’s Not for Dull Meatheads Anymore! You can also get plant-based protein powder with probiotics and digestive enzymes included as well. Interestingly, the most common reaction after trying a probiotic plant protein blend is a glowing, calm feeling of health. Probably this is because of the effect probiotics have on the neurotransmitters (as described below) combining synergistically with the high nutritional content of the greens included in these protein blends. Because of the probiotics, all of the vitamins are finally able to be digested by your body – you can really feel it! Another great probiotic source is kefir, named after the Turkic word for “euphoric” because of the great feeling people get after drinking it. Kefir is a traditional, yogurt-like drink made by fermenting milk with a mysterious strain of bacteria of unknown origin called “kefir grains.” You need the kefir grains to make kefir, but once you have them you can make it over and over again. Kefir is packed with probiotics, but it also is an easy way for lactose-intolerant people to digest milk, since the kefir grains break down 99% of lactose. Kefir is also a great source of Vitamin K2, a rare nutrient associated with optimal health by Dr. Weston Price, who raved about the great power of probiotic foods like kefir for this reason. Try mixing your protein powder in kefir for an absolutely delicious nutritional double-whammy! One of the major problems with today’s food is that it doesn’t contain enough probiotics. The modern agriculture process wreaks havoc on the beneficial bacteria that should be all over the veggies, fruits, and dairy that you consume. The food our ancestors consumed didn’t have this problem, and our ancestors didn’t suffer from most of the diseases we suffer from today! Hmm, maybe this isn’t a coincidence! GMO (genetically modified organism) produce and fruits are especially bad for probiotics. Not only do GMO’s provide an alien environment for the bacteria that should naturally grow, GMO’s that you eat actually kill the probiotic bacteria that are already in your stomach. These “frankenfoods” are designed to be harmful to bacteria of all kinds so that more produce can be grown at industrial farms, but unfortunately for our gut health, this anti-bacterial action continues when we eat GMO foods. Every time you eat a genetically modified veggie your probiotic count goes down even farther, making it very difficult for you to digest foods like protein. If you are exposed to GMO’s (and most of us are) then it is essential that you replace your probiotic gut bacteria with pills, fermented food, or a protein powder with probiotics included. Probiotics aren’t just great for your digestion however; it turns out that the probiotics in your stomach actually manufacture the neurotransmitters that you need for your brain to function well. Incredibly, 95% of the neurotransmitter serotonin (the feel-good, anti-anxiety regulator) is manufactured in your gut by these healthy bacteria, especially the probiotic strains Candida, Streptococcus, Escherichia, and Enterococcus which are all present in unpasteurized sauerkraut. When you don’t have these probiotics in your stomach, serotonin can’t be produced and you won’t be happy. If protein makes your muscles happy by supplying the raw materials for muscle, then probiotics make your whole self happy by giving you literally the “ingredients” for happiness! Probiotics are essential for mental health – for a happy family, think about probiotics! We hope you’re convinced to give probiotics a try after reading this article; better digestion, happier moods, and generally good health could be just around the corner. We certainly hope so! It’s hard to find a good protein powder that doesn’t contain chemicals these days. You drink protein shakes for your health, so why would you want to be consuming possibly dangerous chemicals along with your protein? Most supplement companies are trying to cut costs by using cheap chemical sweeteners, preservatives, and other artificial ingredients in their protein powders, chemical ingredients that in many cases are known to have serious health effects. All-natural protein powder, with ZERO extra chemical ingredients, is worth its weight in gold. The following protein powders are absolutely pure, derived from natural protein sources. We have included a grass-fed whey protein powder, two plant-based protein powders for vegans, and a paleo protein made from eggs as well. The ONLY ingredients in each protein powder are listed in the table. Keep reading to learn why you want to stay away from other chemical-filled protein powders. Each of these protein powders has only a few ingredients on the label: the protein source itself, a natural extract for flavoring (and no, we aren’t counting undefined “natural flavoring” here), and an agent used to keep the protein from clumping. Most companies use soy lecithin, but we never recommend soy of any kind, because of its estrogenic activity and the anti-nutrients it contains. All the protein powders listed here are totally free of soy, including soy lecithin. These proteins are also made from all-natural sources, with minimal pesticide or other chemical contamination. While cocoa is a natural ingredient, lecithin is a highly-processed compound added to the protein during the manufacturing process in order to make it blend better. Most probably this refers to soy lecithin, which is the sludge left over after soybeans are pressed into soy oil. Soy lecithin can only be produced by an industrial factory process. Acesulfame Potassium is an artificial sweetener, known to be quite bad for your health. It should be strictly avoided, according to the Center For Science in the Public Interest. Oddly enough, so-called “natural flavors”are not necessarily much better than artificial flavors. To be labeled a natural flavor, according to the FDA, the compound has to be isolated from a material that was at one time part of a plant or animal. This is typically a factory process, and the flavor may have been modified afterwards, but it will still be labeled a “natural flavor” no matter how processed an unnatural it has become. Usually both natural and artificial flavors are made in factories. Aspartame – a highly unnatural chemical bonding of amino acids and methanol. Aspartame appears to increase risk of cancer, as well as cause headaches, a higher chance of pre-term delivery of babies, and probably more. Not good! Acesulfame K (also known as Ace-K) – its chemical structure is Potassium 6-methyl-2,2-dioxo-2H-1,2λ6,3-oxathiazin-4-olate. Ace-K appears to poorly affect the thyroid. It has not been very well studied and it may have other bad effects. Avoiding whey is a good idea if you’re lactose-intolerant, have a whey allergy, or you follow the paleo diet. Whey protein powder can produce gas, stomach cramps, and bloating for people who are allergic or have lactose intolerance. Others may find their skin breaks out due to a sensitivity to whey. Although whey is the most common ingredient in protein powder (because it’s cheap), there are lots of great whey-free protein powders available. These protein powders are made from ingredients like eggs, peas, or even hemp. The egg protein listed below is 100% paleo, and the pea protein is vegan as well. So what the heck is whey? Basically, whey is a byproduct of cheese-making. The first step in making cheese from milk is to separate the solids in the milk, called curds, from the liquids, which are called whey. The curds are then further processed into cheese, but that’s a different story. What’s left over is the liquids, the whey, which the cheese manufacturer has no use for. Curds on the left, whey on the right. Pasteurization to kill any bacteria (both harmful bacteria as well as any good, beneficial bacteria) A side effect of the 162+ °F pasteurization process is the denaturing of the protein. Denaturation basically breaks the internal structure of the protein molecule, resulting in an artificial variation of protein. For a more detailed discussion of the possible risks of denatured whey, see this article by Integrated Supplements. Drying – the whey is blasted by alternating hot and cold air until only the solids remain and the water has all evaporated. While whey powder does have a high protein content, as you can see it is sort of an artificial food. Whey and curds don’t really separate in nature, and whey definitely doesn’t get isolated into powder form outside of industrial manufacturing. It is no surprise that many people find themselves unable to tolerate whey protein very well, because your body is not really designed to absorb this highly processed food product. Your food should come from nature, not science fiction! Lactose intolerant people do not have enough of a digestive enzyme called “lactase” which is needed to fully digest the lactose in whey. (Digestive enzymes are the natural substances that your body produces in order to digest different foods.) All products made from cow’s milk, including whey protein powder, have lactose in them. Undigested lactose goes straight into your colon, where it can only be broken down by bacteria – a process which causes fermentation and a big gas release. This gas is the reason lactose intolerant people get stomach pain, bloating, and flatulence. To avoid these unpleasant symptoms, people who suffer from lactose intolerance need whey-free protein powder! This little calf doesn’t need whey protein powder! Pea protein, rice protein, or hemp protein are all great source of whey-free protein powder. These are especially good for vegans, and pea or hemp protein are great for people who have allergic reactions easily, since these two protein sources are hypoallergenic. You may be concerned that these protein powders will taste bad, perhaps because of bad childhood memories of being forced to eat peas, but they are really quite normal tasting. Mix a little cocoa powder into your pea protein shake and you’ll be perfectly happy with it! Going paleo means giving up whey! Paleo dieters need to avoid whey protein as well, since dairy products would not have been available before the Neolithic Revolution. Producing whey especially requires a degree of processing that cavemen would not have done. Eggs or beef both make great paleo protein powders that are completely whey free. If you like eggs, why not make your protein powder from them? Soy-based protein powder has no whey in it, but we can’t recommend it. Soy contains several anti-nutrients and has a significant hormonal effect on the body. Men especially should avoid soy because it increases estrogen, a female hormone. This doesn’t mean soy is good for women either, since any hormone imbalance is not really a good thing. Soy probably increases the chance of breast cancer and fat retention in women. When there are other great whey-free protein powders around, there’s really no need to mess with soy. Why does whey protein trigger my lactose intolerance? When you are lactose intolerant, you lack a digestive enzyme called “lactase.” Digestive enzymes are natural chemicals that your body creates and uses to digest different foods. Your body needs the lactase enzyme so that you can fully digest lactose. Lactose is a sugar contained in cow’s milk and in products made from cow’s milk, including whey protein powder. Cows aren’t lactose intolerant, that’s for sure! When a lactose-intolerant person drinks a whey protein shake, the lactose in the whey can’t be digested properly because the person’s small intestine can’t make enough of the lactase enzyme needed to process the lactose properly. Contrary to popular belief, lactose intolerance is actually not an allergic reaction to dairy. Without the lactase enzyme to break it down into something digestible, the lactose goes directly into your colon. Your colon can handle this undigested lactose, but it uses bacteria to break down the lactose. A side effect of these colon bacteria is fermentation – which causes extreme release of gases. This is the source of the bloating, pain, and flatulence that you’re probably familiar with at this point! Obviously the best way to avoid lactose intolerance symptoms from protein shakes is to only use lactose-free protein powder! Easy, right? So why can’t your body produce the lactase needed to digest lactose properly? Lots of other people don’t have any problem but for some reason you do, it doesn’t make sense! While there are several reasons for lactose intolerance, it turns out that it’s mostly genetic. 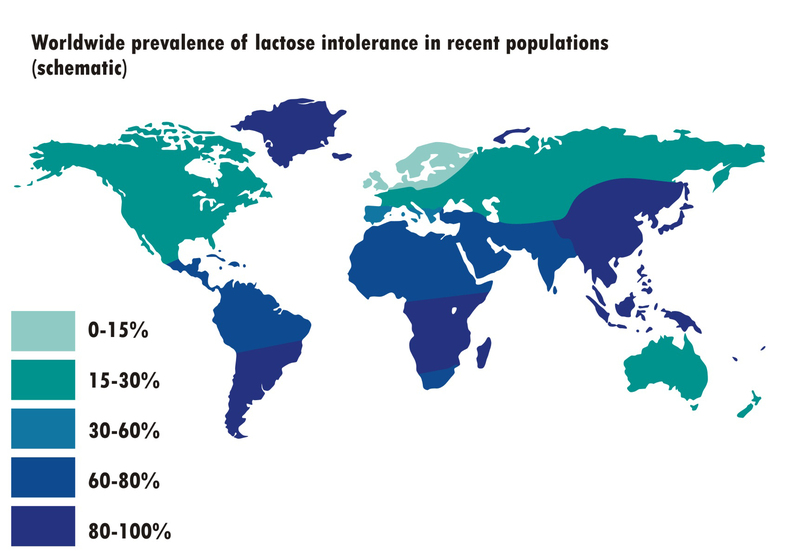 Thousands of years ago, everyone was lactose intolerant, all around the world. However, between 10,000 and 4000 years ago, ethnic groups which traditionally kept cattle developed the ability to tolerate lactose. This was advantageous for them, since it meant they could drink milk, which was a valuable nutrient source. For this reason, people from Northwestern Europe and certain parts of Eastern Africa are usually able to fully digest lactose. Unfortunately for other ethnic groups, the ability to tolerate lactose did not spread everywhere. If you are a member of an ethnic group from a region where dairy is not a traditional food source, you will probably be lactose intolerant. For example, 47% of Mexican Americans are lactose intolerant, according to one study. Sadly, there is no actual cure for lactose intolerance, although replacing dairy products with products made with goat’s milk instead of cow milk is often a successful way to get around this problem if you are only mildly lactose intolerant, since goat milk contains slightly less lactose. Lactose-free and plant-based, what’s not to like! If you are legitimately lactose intolerant, and you still want to drink protein shakes (you should! ), your only choice is to avoid whey and any other protein source that contains lactose. Basically, if it came from a cow, stay away! There are several good protein powders made from sources that are lactose-free. If you are vegan, or want a hypoallergenic option, you can try hemp protein or pea protein, both of which taste much better than they sound, we promise! Pea protein powder and hemp protein powder are both equally good, in fact, they’re like two peas in a pod… Ok, ok, no more jokes, we get it – protein powder is serious business right?! Peas make for surprisingly good protein shakes. We can’t promise your egg protein will be made from double-yolked eggs, but we can assure you there’s no lactose in there! Although soy-based protein powder doesn’t contain lactose and therefore you can use it if you are lactose intolerant, we usually recommend other protein sources first. Soy can have bad effects in the body, as it mimics the action of a major hormone, estrogen. This artificial change in hormones can cause weight gain, acne, or even breast cancer. These risks don’t seem worth it when there are other great protein powders available that won’t trigger lactose-intolerant symptoms. Whatever protein source you choose, stay away from whey, which is chock-full of lactose. Whether you go with hemp, eggs, soy or anything else, we wish you the best of luck and we truly hope this article helped you find the best protein powder for your lactose-free life! Vitamin J, or choline, is very important for the brain. It is a critical component of the brain neurotransmitter Acetylcholine, which facilitates intelligence, memory, and even improves your mood. For this reason, supplementing your diet with Vitamin J has been shown to cause improvement in these areas. Vitamin J deficiency is especially high among elderly people. Shockingly, one study found that 90% of older people have too little Vitamin J in their diets. Since the elderly are already at risk of memory loss, this makes Vitamin J deficiency a big problem for this group. A healthy diet containing enough nutrients and protein is critical for elderly people to stay fit and well. A high protein intake is important for everyone, but it is especially critical for elderly people. Studies have shown that as your body ages, you begin to digest protein less efficiently, which means the daily protein requirement for seniors is higher in order to maintain the same health and strength of a younger person. How much protein do older people need? Seniors need at least half a gram of protein for every pound of bodyweight, according to Protein Requirements and Recommendations for Older People. For example, a 120 lb 80 year old woman should try to get a minimum of 60 gram from protein in her diet every day. Since chewing can become difficult for seniors, and appetite often lessens with age, it’s challenging to get this much protein from whole foods like meat or cheese. You’d have to eat about three chicken drumsticks a day to get 60 grams of protein, which is out of the question for an older person who’s on a soft food meal plan, perhaps because of tooth loss or other issues. This is where liquid nutritional supplements like protein shakes become lifesavers! Delicious, but not easy to eat if you can’t chew. Protein isn’t just for bodybuilders; modern protein shakes are perfect for anyone who needs a little extra help supplementing their food. Hypoallergenic, high quality protein sources make the best protein powders to add to a senior’s meal plan. The following brands are great choices; more detailed information is available after the chart. Why do elderly people need protein? For seniors, eating plenty of protein is critical for muscle retention and bone strength, but also for the health of your hair, skin, and even your brain! The amino acids contained in protein form the building blocks of all the tissue in your entire body, so when you don’t get enough protein in your diet, there are bad effects all over, including easy bruising to your skin, hair loss, slow wound healing, increased fatigue, and even loss of appetite. Unfortunately, whey isn’t an option for everyone, whether because of lactose intolerance or a dairy allergy. Protein powders made from other ingredients, such as peas, eggs, or hemp, all make good alternatives to whey. Pea protein and hemp protein are both hypoallergenic, which makes them a very safe choice for elderly people with sensitive immune systems. It’s important to keep in mind that protein won’t solve all our problems, important as it is. Older people need exercise, hydration, and sleep as well, to keep themselves strong and healthy. Protein can help keep muscles strong, but we need to exercise those muscles too! A healthy, balanced diet is very important as well, since protein is not the only nutrient we need to get. It’s just as important to eat lots of vegetables, fruits, and sources of good dietary fat, like fish, grass-fed meat, or even avocados. That being said, a good protein drink can be a godsend for a chewing-impaired elderly person! We wrote this article hoping to make a real difference in the lives of seniors trying to avoid muscle wasting and other nasty health problems that come with low protein intake. If this helps just one elderly person out there, then we’ve succeeded!